I don’t know where I got this picture from but I found it in My Pictures as I was rumaging. I happened to be rumaging the same day I was reading through N.T. Wright’s new book, Surprised By Hope and was even furthered in my conviction that we’ve made a mountain out of a non-existing mole hill in our Lahaye, Left Behind fervor. 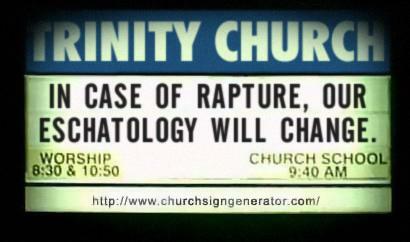 I for one don’t believe in any sort of rapture, but like the sign says, in case of rapture, my eschatology will change. But it almost seems like there is this fear in some churches that if you don’t believe in the rapture you won’t participate in the rapture.  If the idea of the rapture is somewhat debatable in Scripture the idea that if you don’t believe in it you don’t participate in the 2nd coming is not. Anyway, Wright does a great job of dispelling the 2 (that’s right, only 2) proof-texts given in favor of a rapture in favor of a much more holistic and culturally plausible exegesis of those texts.